After a chaotic experience with the locals, we arrived Hanoi with much angst. We shall never get fooled by any locals was our game. Upon arrival at Hanoi airport, we were met by soliciting taxi drivers for a fixed taxi fare. We walked past them and found a seemingly nice taxi driver who was willing to take us to the city on a meter. We took the risk and thought, we cannot forgive ourselves if we get into a trap again. Luckily, there are a few good men. Shortly, we found our hotel for the night, Indochina Queen booked through agoda. The receptionist was a good looking tall fair Vietnamese guy. That's a rare find in Vietnam! He came out and helped out with our bags and made sure we had no issues with the taxi driver. He was very accommodating and I was particularly fond of him saying "certainly" in British accent each time we asked for something. Just like in Ho Chi Minh, the facade of the hotel was narrow. The room was spacious and well equipped. Arriving close to midnight, we had to hurry and pack an overnight bag for our much awaited trip to Halong Bay. The hotel gladly stored our luggage overnight while we were out in Halong Bay at no extra fee. After settling in, from an overnight trip at Halong Bay with Indochina Sails, we went to see the water puppet show at the Thang Long Water Puppet Theatre at 8pm for 40,000 dong. The theater was a few blocks away from the hotel and the receptionist advised us just to walk to get there. The show wasn't a must see, but knowing that it was brought around the world gave us a reason to see it for ourselves. We walked around Hoan Kiem Lake with numerous dating couples and locals dancing in the night and finally found Fanny's Ice Cream Parlos. The presentation was definitely fantastic, the taste was so so. I love the weather in Hanoi. Day 2 was allotted for a day tour around Hanoi's historic spot - Ho Chi Minh mausoleum and it's adjacent presidential palace and museum. We also visited the temple of literature. It was obviously, of Confucian influence with chinese characters all over. 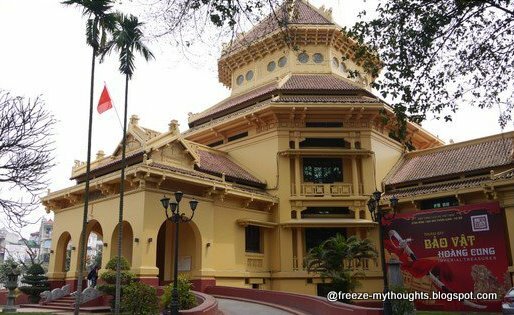 The Vietnamese Museum of History was not for me, we killed time lounging at the museum, since there was not much people here, it was definitely cozy for some cheezy conversation. The cafe next door also was a great place to hangout with, serving some good opera cake.